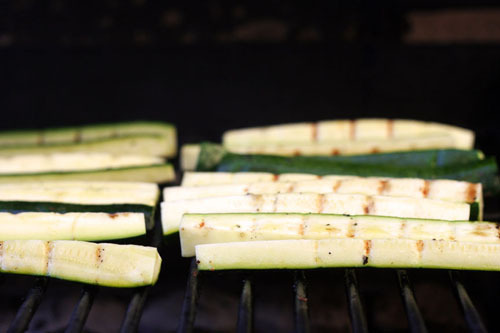 Surprisingly I have never grilled vegetables outside on the grill…until now. I have ventured into the brave new world of grilled vegetables and am wishing I had done so sooner. This was the best zucchini! Cooked to perfection with really great texture. I can’t wait to try more veggies on the grill…speaking of which, if you have experience, which vegetables have worked best for you? Any grilled veggie tips? In case you’re wondering how I cooked these puppies…I tossed the sliced zucchini in olive oil and sprinkled with my favorite seasoned salt, Onera*. I then grilled over medium heat for about 5-7 minutes. *The Onera website isn’t working…I know they were struggling to stay in business, I’m thinking maybe the struggle has ended. I’m so sad. WHAT AM I GOING TO DO?!?! I’ll tell you one thing, my chicken salad will never be the same. I better use my last shaker of Onera wisely. I didn’t think I liked most vegetables cooked until I tried them grilled. Zucchini, yellow squash, asparagus, tomatoes and peppers–all great off the grill. Is fruit next? I love a grilled pineapple, peach, nectarine or plum. oh yes, and corn! and I second the comment about grilled pineapple. so yummy! I have never grilled any other fruits, but roasted peaches and nectarines are delish and I imagine they’d be great grilled too. Try marinating the veggies in your favorite Italian Salad Dressing for a couple of hours, and then throw them on the grill. They’re delish! We grilled a lot of bell peppers this summer. Just cut them in half, toss with olive oil, salt, pepper and garlic powder and then grill for the about the same time/heat you do with your zucchini. We LOVE grilled veggies. Some of our favs are pineapple (I know, not a veggie, but so amazing), green and colored peppers, onions (oh so sweet), potatoes and the best… asparagus. My 8 year-old son and I fight over the grilled asparagus. So delicious! A grill wok is a must have for grilled vegetables. I use it several times a week all summer. I chop my vegies into large chunks, shake them up in a large ziploc with olive oil and my favorite season-all (Back of the Yards Garlic Pepper from The Spice House–Chicago company with the best spices, thespicehouse.com), then pour them into the grill wok, which has been sprayed and heated on the grill. Stir occasionally and splash a little more olive oil on during cooking to get that fabulous smokiness. Amazing stuff. well, that’s the best news I’ve had all day! glad you found that nicole…gonna look into it! THANK YOU! Grilled veggies are super popular at our house. My favs are asparagus, red onions, olives, mushrooms, grape tomatoes, peppers, and zuchini. Like Collette, I chop them up, put them in a ziploc with a little olive oil and just a little salt. I will never boil corn again! Grilled is the BEST! Sweet and tender and juicy! Leave husks on while grilling! In so cal we have learned from mexico to add mayo and chili powder-try it sometime! I just discovered grilled veggies recently also! I was so excited and how yummy they all were. Grilled broccoli is really to die for. I buy the basalmic glaze at the store and put it over my veggies and rice and i’m in heaven! I grill asparagus for my husband all the time! he loves it! We also enjoy bell peppers, onions, and garlic…yummy! We grill vegetables almost every Sunday, as accompaniment to a juicy steak or marinated chicken. It’s our favorite dinner. Our favorite veggies are asparragus, mushrooms, bell peppers, chilies and zuchini. My 4 yr old daughter prefers grilled asparragus over any fruit! Leftover grilled veggies (if any!) are used the next day in a salad of field greens. Delicious!